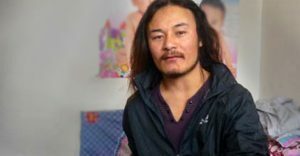 [22 October 2016] On 19 October, approximately 100 Tibetans and Tibet supporters gathered in London to take part in the Global Day of Action in solidarity with Larung Gar. Approximately 20 protests and actions took place in cities across the world, including Dharamsala, New York, Tokyo and Toronto. The London protest took place over four hours opposite the Chinese Embassy. At the start, a large banner was unveiled which read “China: Stop Religious Repression in Tibet” with an image of the Larung Gar Buddhist Institute. Throughout the evening, protestors waved Tibet flags and placards with images of the demolotion at Larung Gar and messages saying “Stop the destruction”. Individuals also held up signs saying “I Stand With Larung Gar”. Leaflets were handed to passers-by as the crowd chanted slogans calling for an to China’s brutal policies in Tibet. Speeches were made by representatives of the organising groups: Free Tibet, Students for a Free Tibet, Tibet Society and Tibetan Community UK. Prayers were said for all those suffering in Tibet and a minute’s silence was held for the three nuns who committed suicide in protest against China’s interference at Larung Gar. As night fell candles were lit, before a final round of chanting was held calling on China to stop the demolition at Larung Gar.